Paint dining chairs in bright colors and arrange them around a neutral tabletop. 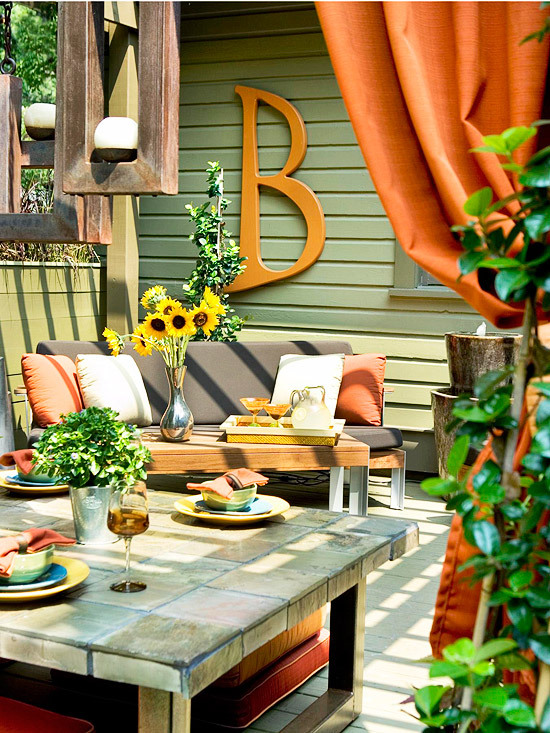 Distressed finishes and bold accessories give this open-air dining space even more personality. Set a colorful tone to your home with a front door decked in a fresh hue. Choose a color that works with your home's existing exterior palette. 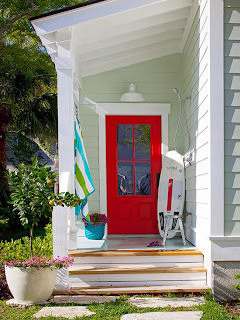 Here, a juicy red door pairs with pale seafoam green siding, creating a complementary duo. Colorful containers are a simple way to brighten an outdoor space. Choose pots in various colors, sizes, and textures. 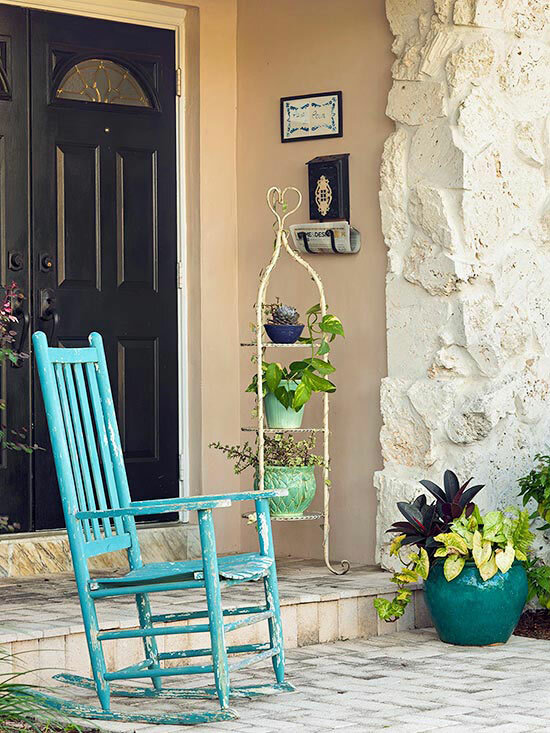 While outdoor living spaces in the backyard are prime for color infusions, don't forget your front stoop or porch. 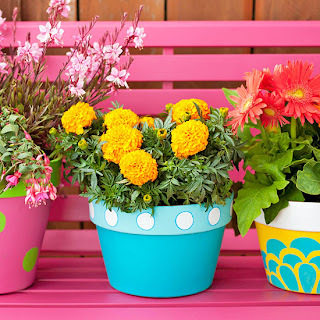 Use colorful pots for plants, or even add a piece of furniture or two. Unify furnishings in a spectrum of colors with the accessories you choose. 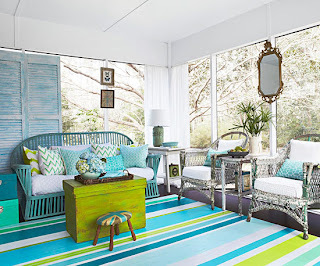 An assortment of furniture pulls together as a seating area when they share stripe pillows. An outdoor rug unifies the arrangement. Turn a scrap of vinyl flooring into a colorful rug for an outdoor space. 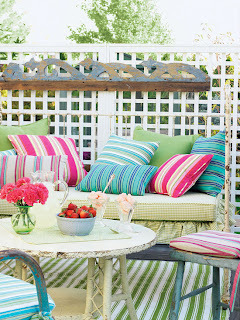 Flip the piece upside down and paint the backside in a colorful pattern that suits your tastes. Be sure to use paint formulated for exterior applications. Provide sun protection with style. 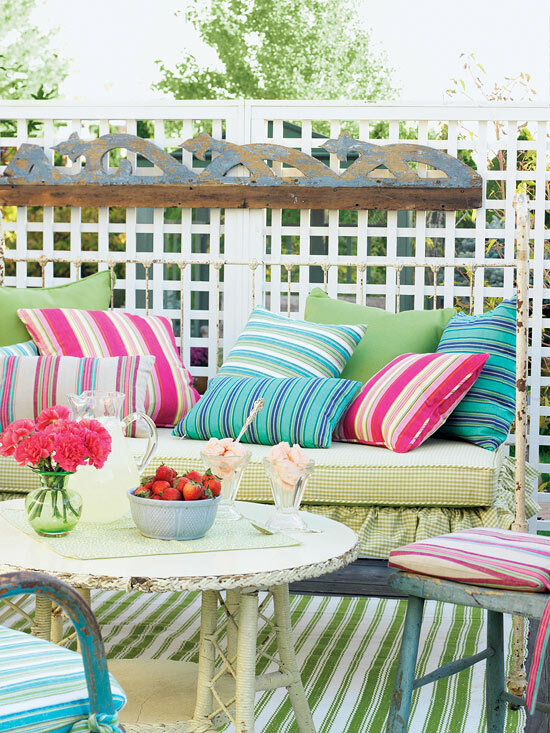 Upgrade your patio or deck with an umbrella that sports a fun color or pattern. 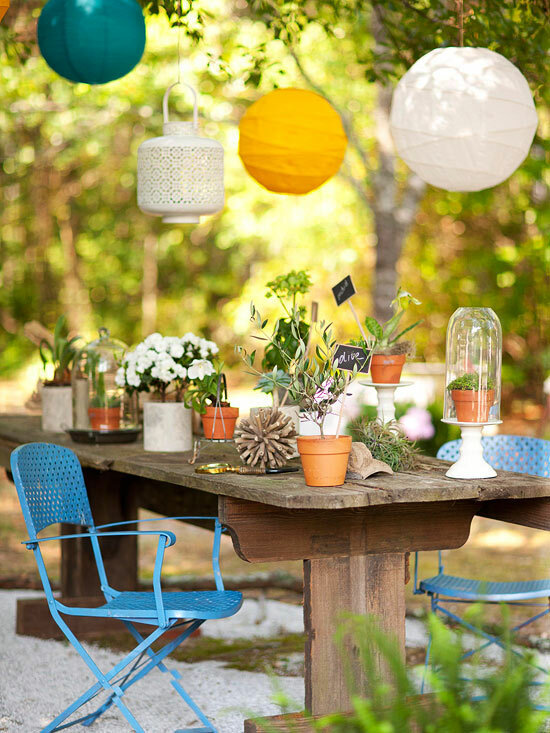 Bring your outdoor spaces to life with vibrant decorative accessories. 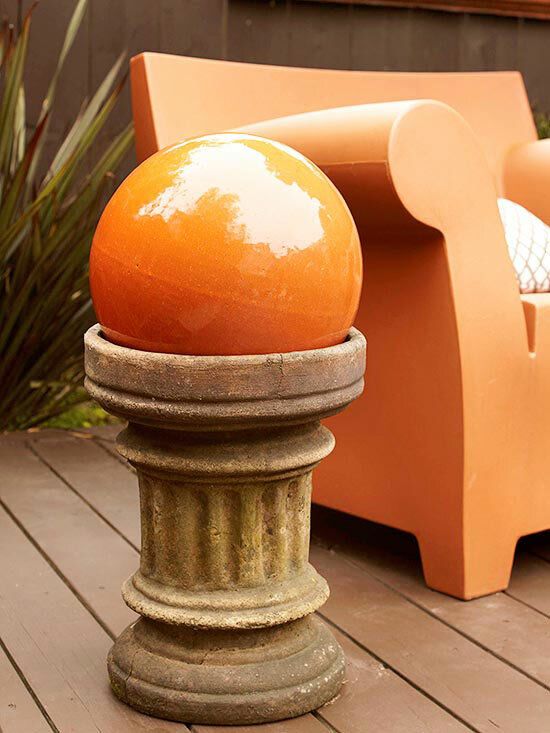 Look to garden sculptures, gazing balls, and accent furniture as go-to objects to display. 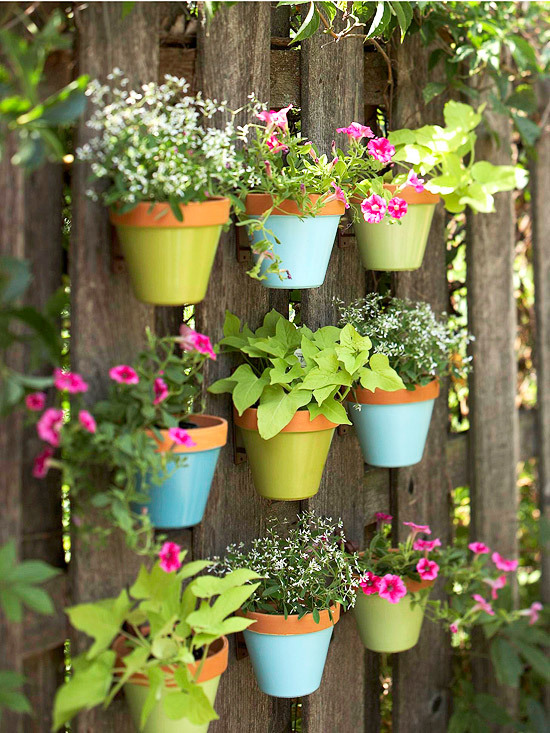 Add color to your outdoor decorating with a fence covered with suspended flowerpots. It's wall art for your outdoor room. Start with nine terra-cotta pots and coat the bases with spray paint. Next, plot the grid arrangement and secure pot hangers to the fence. 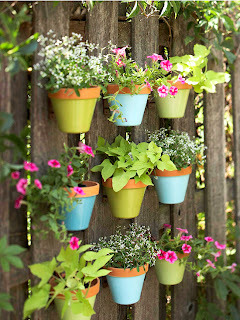 Finish by suspending pots from hangers and filling each container with brightly colored annuals or herbs. 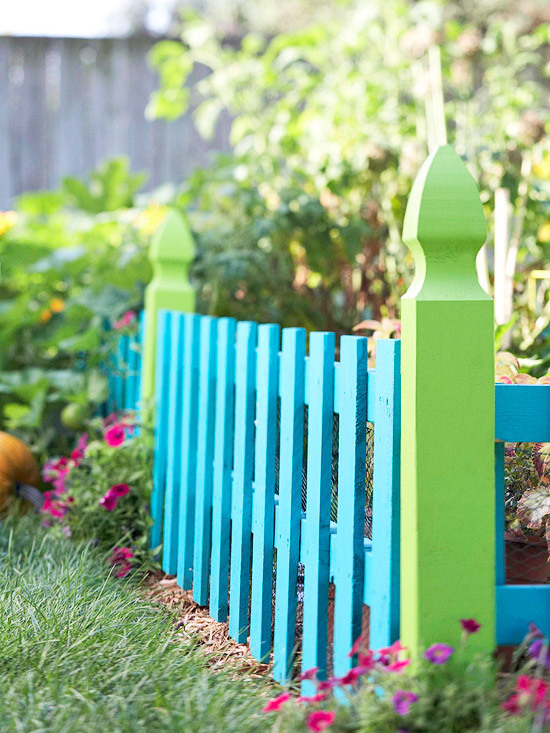 Separate a garden from the rest of the backyard with a colorful fence. The bright green and blue hues pop against the grass and plants. 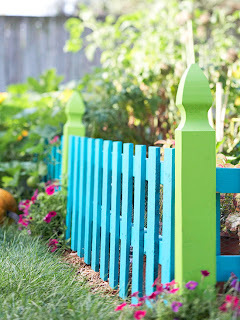 The fence provides a colorful view from any angle. Metal furniture is generally affordable and it gives a cool color vibe to your garden or patio. A bar cart is always ready for a party, offering up a handy serving surface. 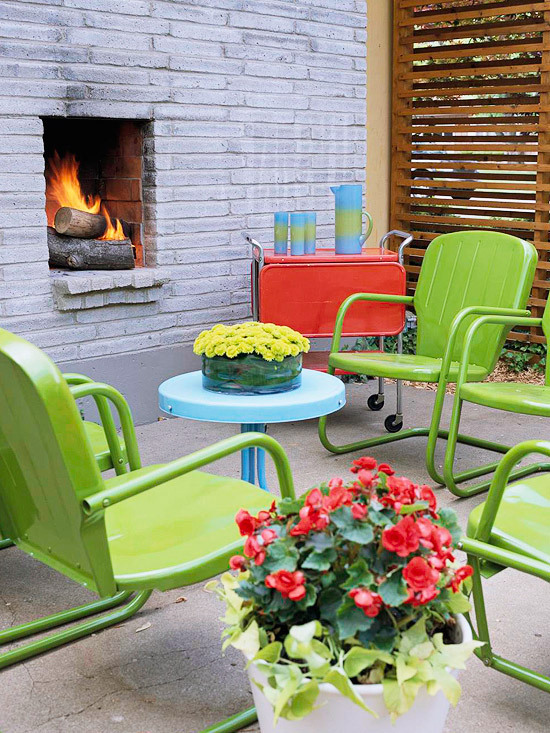 The home's exterior creates the perfect starting point for this patio's color scheme. 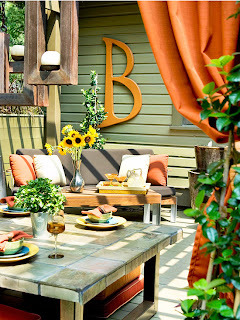 Orange accents, such as throw pillows, hanging fabric, and an oversize letter "B," stand out against the green exterior. Wood candle holders and potted plants bring the natural elements of the yard onto the patio. With plenty of seating and multiple tables, this patio is just right for enjoying bright summer days and warm summer nights.